My grandparents will travel to London to stay with relatives for a few months, and plan to borrow books from the local (and NOT university) libraries. 1) Am I right that each borough has its own library? See the map below. 2) If the answer to 1 is 'yes', where can I find a website that lists ALL the borough's libraries' websites, instead of Googling each borough? 3) Does the City of London (1 below on the map) have libraries? I do not grasp this: Wikipedia claims that The City is "not a London borough"? 4) Can books be transferred between libraries of different boroughs? For example, if City's libraries do not have a book, but Westminster borough's libraries do, can Westminster Borough's libaries loan it interlibrarially to City's libraries? Although I grasp that anybody with proof of UK address is not confined to his/her borough's libraries and can register with any borough's libraries, it is much easier for my grandparents to request interlibrary loans instead of registering with and then travelling to 6 boroughs' libraries depending on which has the book. Afterword: After the answer below taught me about the London Library Consortium (or LLC), I found a better map under that shows all the London boroughs, plus highlights the libraries in the consortium. This signposts all the individual libraries in the LLC. 1.) Yes, every borough has, in most cases, more than one library. 3.) The City of London is just one of London's 33 local authority districts, but it's the only one that's not a borough (it has been administered separately since around the 9th century). But, just like all other districts, it too has libraries (see here: http://www.cityoflondon.gov.uk/services/libraries-and-archives/our-libraries/Pages/default.aspx). 4.) As the previous answer stated, for libraries within the London Libraries Consortium, it's possible to do interlibrary loans, but else it's not. 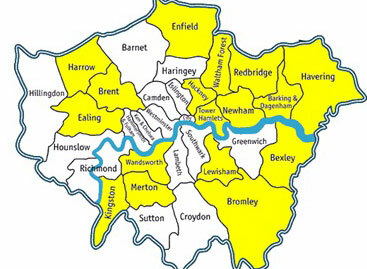 Here's a map of the London Libraries Consortium libraries. The London Libraries Consortium has 14 boroughs but not all of them so it's highly doubtful it's doable (or if doable then feasible) to do interlibrary operations outside of these 14. Within these 14 "able to borrow and return items to any libraries". The previous two answers are correct regarding the library system in the UK, but I feel I should warn you about the requirements about joining a library. You usually have to be a permanent resident and proof will be needed to join a library, receive a library card and checkout (loan) books. You can still use the facilities of libraries if you are not a member, but you will be not be able to loan out any books. For Westminster libraries your grandparents may qualify for a short stay membership, but I am not sure what library benefits that will give them. Is the London Pass worth the price? In London, it is better to do sight-seeing in the morning or the afternoon?